SOFIA, Bulgaria, (BulgarianMilitary.com) – In an recent official announcement made by the Italian respondent to the Bulgaria’s tender for the acquisition of eight fighter aircraft, Leonardo, it is said that the Italian government and the aerospace company have offered to the Bulgarian Ministry of Defence and an optional delivery of newly built Eurofighter figthers, learned BulgarianMilitary.com. In particular, the Italian company states that its proposal to the Bulgarian Ministry of Defence includes the supply of eight Eurofighter Typhoon Tranche 1 combat aircraft, currently operated by the Italian Air Force. 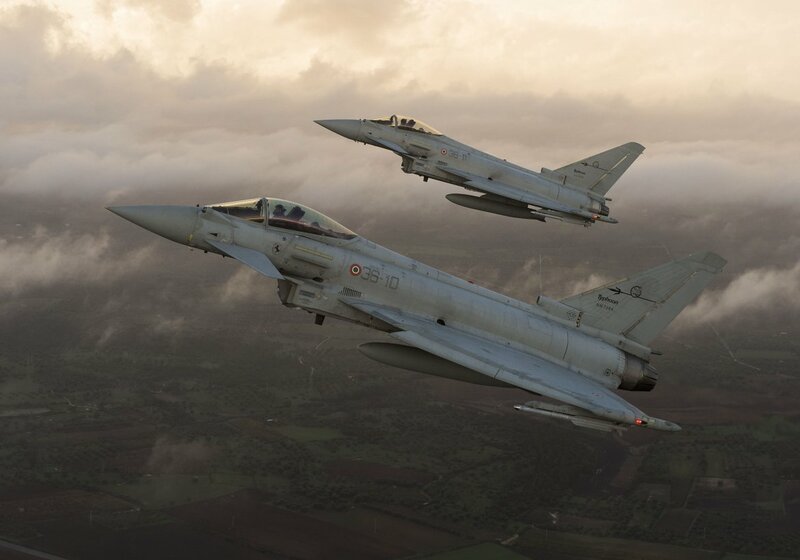 As well as and an option for the delivery of newly produced aircraft, which actually meets the Bulgarian requirements, but differs from what was announced on the opening of the bids on 1 October, that the Italian proposal is only for a second-hand Eurofighter jets. The announcement refers to the words of the Leonardo’s Aircraft Division Managing Director, Lucio Valerio Cioffi, who revealed, in conclusion, the company’s readiness to supply to Bulgaria newly built aircraft as well as the Italian Air Force’s Tranche 1 Eurofighters. He said: “The Eurofighter has already demonstrated its outstanding capabilities while performing Air Policing activities in 2017 from Graf Ignatievo Air Force Base.” He added that according to him, Eurofighter Typhoon is a cost effective and attractive solution, which will provide the Bulgarian Air Force with capabilities to perform every mission. It will also give to our country, opportunities to participate in various European defense programs and initiatives, considering the fact that the Eurofighter Typhoon is the biggest and most successful defence collaboration program in Europe, with 623 aircraft ordered. However, the Italian company does not give more detailed information about its bid. Previously, the Ministry of Defence considered the acquisition of Еurofighter as new fighter aircraft for the Bulgarian Air Force, and requested for a proposal from Germany, but did not get any. In a response to the recent announcement of Leonardo, the Bulgarian Ministry of Defence said that no bid for new Eurofighter jets was received by 12.00 on October 1, when the submitting of proposals was due to. BulgarianMilitary.com reminds that the proposals that have been submitted to the Bulgarian Ministry of Defence include Boeing F/A-18 Super Hornet and F-16V by Lockheed Martin, Gripen C/D by SAAB and Eurofighter Typhoon by Leonardo. It is expected, by the end of the month, the appointed group of experts in the MoD to evaluate the proposals, regarding whether they meet the Bulgarian requirements. After that, a second politico-military group will held negotiations with the suppliers. The Bulgarian government hopes to conclude the deal by the end of the year, but the Defence Minister, Krasimir Karakachanov, recently admitted that this would not happen.